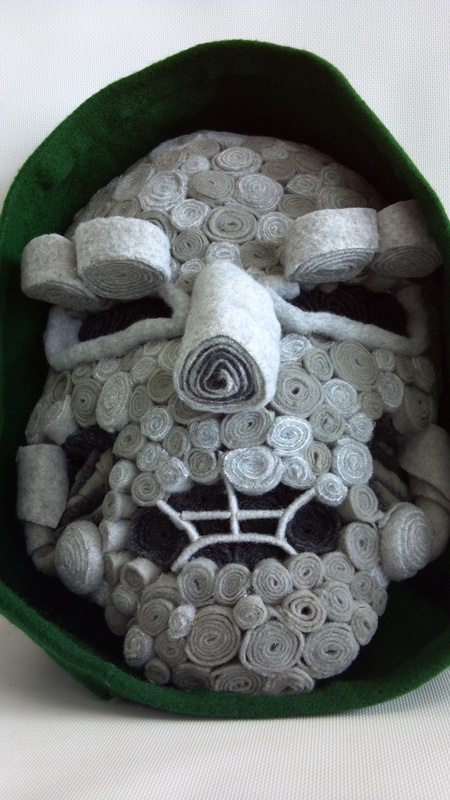 HELLBOY Fiber Art Portrait | tessa.yvonne.morrison. Posted on June 26, 2015 by tessa.morrison. This piece was made for the Chogrin curated “Guillermo Del Toro: In Service of Monsters” exhibit at Gallery 1988. I love Guillermo Del Toro’s work and Chogrin curated the 25th Anniversary of Hellboy Art Show a few years back, which looked amazing. I really wanted to be a part of it and I might of cried a little when I missed out on it. So I started composing an email to Chogrin to ask to be in his next show, and then out of the freaking blue he emailed me first!! I hadn’t even sent my draft to him! Crazytown. I found out that the gallery owner at Gallery 1988 is a fan of my work and sent him my info. Yay, networking! The show was Sept. 11, 2015 at Gallery 1988 in Los Angeles. I flew out to the show and stayed with some friends and my brother. I brought some Hellboy comics for Mike Mignola to sign, because he had a piece in the show, unfortunately he couldn’t make it out for personal reasons. HOWEVER, there was one special guest who showed up, Guillermo Del Toro!!! I got to meet the man himself, and he was so sweet. I didn’t get to talk to him much, but I told him I was an artist in the show and he was super sweet, “Oh really? Want to get a picture together in front of your piece?” Durrrrrrr..::brain melts:::…yes…please? They had a cake of the strange metal scarab apparatus from CHRONOS. The inside was red velvet cake! Nom! The man himself. And me…cheesin’ so hard. Originally I was going to create the Hellboy with the full horns and the flaming crown, but the technique I choose lent itself to his filed down horns way more. The technique I used for this piece is similar to the Dr. Doom piece I did a few years back. They are made up of little sushi rolls of fabric tiled like a mosaic. It’s a distinct look I came up with one day when I was trying to make some fabric beads. This entry was posted in Art Exhibits, Fabric Art / Puppets and tagged caricature, chogrin, fabric art, fabric art sculpture, felt art, fiber art, fiber art portrait, fiber art sculpture, Gallery 1988, guillermo del toro, HB, Hell Boy, Hellboy, Mike Mignola, portrait, soft sculpture, textile art by tessa.morrison.. Bookmark the permalink.